The Personal Document Container is ideal for any office environment, fitting comfortably under the desk. The container is also ideal for central areas or by photocopiers. Virtually unbreakable, the PDC offers tamper-free secure paper collection at a competitive price. Nest when empty for easy transportation. 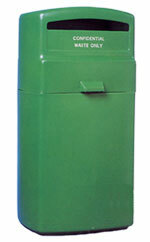 120 litre green plastic bin with a postbox paper slot. These secure paper collection cabinets set the standard for the industry with a wide range of sizes for use by desks, under desks and in central areas. Each cabinet features a narrow slot for posting paper along with a defector screen. With the locking hinged-door, the cabinets are strong, secure and tamper proof. The light grey colour matches any office environment and looks smart and presentable against plastic moulded bins. Construction is in stain-resistant Melamine with an edge-banded paper slot. The front loading design means that the consoles can be used to stand office equipment on top of, maximising the use of available space. Nylon glides are included to protect floors. Double stitched nylon bags are included to fit all stock sizes. Spares are readily available. Double stitched nylon bag included with each console. 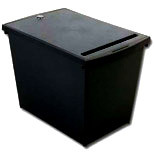 A 100 litre recycling and confidential waste paper container. The innovative Canary Tower design is ideal for high profile applications. Choice of slot size —for single sheet or heavy document disposal. Choice of aperture—may be used for cans and plastics too. Large areas for printing graphics or attaching labels.